It won’t be long before we are ringing in the New Year all across the U.S. Millions will celebrate from the comfort of their homes with friends and family, among a crowd in a local bar, in the suburbs, in the city, everywhere. There is a long list of popular destinations in the U.S. that the crowds will flock to where they can pop open a bottle of bubbly and cheers to the New Year. Here are some of the best places to do just that. This is likely among the top U.S. destinations for welcoming the New Year. After all, the tradition of the ball dropping in Times Square is world-renowned. Unfortunately, unless travelers plan way in advance, it’s likely they either won’t find a hotel reservation for Dec. 31—or if they find one, the price will sorely reflect their lack of planning. Over the border in New Jersey, however, there are often bargains to be had. For substantially less than a New York City hotel room, guests can sleep in New Jersey, but take the train into the city and become enmeshed in the celebration. 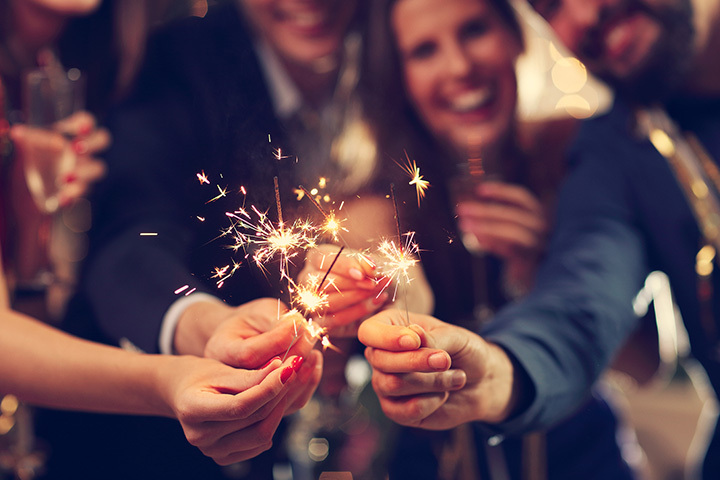 For example, DoubleTree by Hilton Fort Lee sits by the George Washington Bridge, meaning easy access to all New Year’s Eve excitement is just a quick transit ride away. Not far from NYC, but a world away in tradition, celebrate New Year’s Eve with country flair at House of Que. A local country station helps host the event and a country cover band provides live music. Stay nearby at W, where you’ll find great packages for New Year’s Eve. Unlike New York City, Las Vegas isn’t as difficult a place to score a room for New Year’s Eve, and even though the celebration isn’t as big, the city still puts on a fabulous display. Check out Planet Hollywood or the Mirage for rates and availability. Even if they say they’re booked up, keep trying. It’s likely that many rooms will be released in the days leading up to the New Year. While in Las Vegas, take in a show—but not on New Year’s Eve. The parties, fireworks and festive displays of grandeur will be enough of a show for Dec. 31. If you want to gamble, but don’t feel you need to do so in the hustle and bustle of Vegas, check out nearby Henderson, Nevada, where you can ring in the New Year playing craps, dining on fine cuisine, and enjoying a spectacular overnight package. The Sunset Station Hotel and Casino has excellent package options for New Year’s Eve. Second only to New York City, L.A. celebrates the dawning of the New Year in high style. Of course that style comes with a hefty price tag. Plan to avoid the city when it comes to accommodations, and travel to nearby Long Beach instead. The Varden is a classy boutique hotel that will make it abundantly clear you made a good decision when you wake up there on New Year’s Day. A 45-minute cab ride will cost you, but will be well worth the investment. And ask the concierge at the hotel about local shuttles. It’s not unusual to find one running from L.A. in the wee hours on New Year’s Day. Yes, you’ll stop at a variety of hotels on the ride back to yours, but it still solves the dilemma of driving in and out of L.A.
For a completely different kind of New Year’s Eve celebration, consider visiting Catalina Island, where their annual celebration includes package deals on dining and lodging. This will be the 44th year of the popular extravaganza, and while it is exciting, it isn’t big city excitement. It’s a city-by-the-sea kind of bash. It’s far more relaxing, and the views can’t be beat. Celebrate New Year’s Eve as a family in Carlsbad. The Sheraton Carlsbad Resort and Spa is holding an intergalactic evening full of family fun. Check out the FUTURISTIC BASH that includes both an adult and a children’s buffet, as well as a DJ that keeps the family on the dance floor so they can ring in the New Year in style. Celebrate the New Year in sunny Florida, where even on Dec. 31 and Jan. 1, the weather is typically warm. Known for a wealth of boutique hotels and live music just steps from Miami Beach, there are options galore for ringing in the New Year. For dancing, dining and more, visit the website New Year’s Eve Party Places. Just minutes from Fort Myers, Florida, New Year’s Eve on Sanibel Island is akin to visiting a different world. Boasting the same sun as Miami—just two hours away—Sanibel is a far cry from the noise and the action—not to mention the soft white sand beaches. The barrier island affords those who want a tranquil New Year’s Eve the option to do just that. Check out the Sundial Beach Resort and Spa for a romantic getaway or a New Year’s Eve adventure the whole family will love. Located on a smaller barrier island than Sanibel, Fort Myers Beach boasts the Pink Shell Beach Resort, where New Year’s Eve is celebrated in a big way. Step out onto the soft white sand, swim in one of their luxurious pools, and sip bubbly under a palm tree as you celebrate the year to come. The resort has activities planned for the kids so the grownups can enjoy a special evening that’s all their own. Savannah’s Riverwalk comes alive on New Year’s Eve, with restaurants and bars, shops and hotels all getting in on the party. Take a Savannah Riverboat Cruise, where you’ll enjoy fireworks and more as you get ready to celebrate the New Year. The Bohemian Hotel Savannah Riverfront is just steps away when your boat docks for the night. Located just across the harbor from the city of Charleston, Mount Pleasant celebrates New Year’s Eve in a bit more laid back, but definitely still exciting, way. The Charleston Harbor Resort and Marina offers live music and fun and games for all ages on New Year’s Eve. The sunny, inviting guest rooms and delicious buffet breakfast will cure even the worst hangovers on New Year’s Day. Boston celebrates First Night on New Year’s Eve, and despite the often-freezing weather, droves of people converge on the city to enjoy music, ice sculptures, food, drinks, and a wealth of family friendly events. The Boston Harbor Hotel affords exceptional views of fireworks—shot off from the middle of the Charles River—as well as exceptional room service for breakfast on New Year’s Day. Featuring its own First Night celebration, Portsmouth boasts an exemplary ice sculpture display, live music, puppet shows, dancing, singing and more. The Sheraton Portsmouth Harborside Hotel is steps from First Night, and affords guests a view of the Piscataqua River and its tugboats on New Year’s Day. Be sure to stop by Popovers in Market Square while visiting Portsmouth, and enjoy a freshly baked popover with a hot cup of tea. A winter stroll through Strawberry Banke is a trip back in time. Most people don’t think of Maine as a unique place to spend New Year’s Eve, but then again, most people haven’t been to Bangor. Unlike Maine’s coastal communities, Bangor is a small city that packs a mighty punch. Bolstered by the nearby University of Maine and the relatively new Waterfront Concerts park, it is a community rich in culture and quick to bring new excitement to town. On New Year’s Eve, Downtown Countdown Bangor lists activities for families, kids, couples, and more. A stay at Hollywood Casino Hotel—just five minutes from downtown—puts guests in the midst of a dazzling casino, delicious cuisine, and a view of the beautiful Penobscot River. Ringing in the New Year in Bangor is the ultimate New England winter experience. As you can see, there are abundant options for New Year’s Eve destinations. But don’t wait too long to book accommodations. Even in the smallest of cities, those places can fill up fast. Happy New Year!